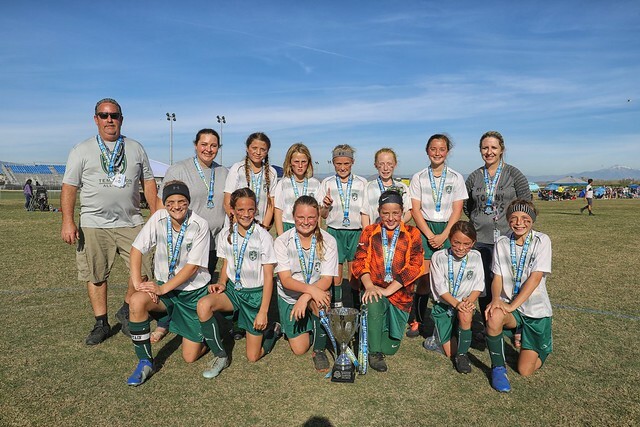 Cal South hosted an unforgettable Fifth Annual Recreational Tournament of All-Stars on Jan 26-27 at the Silverlakes Complex in Norco, with over 90 teams participating in the end-of-season recreational tournament. All Cal South Districts were well represented throughout the tournament, with teams coming from all over Southern California, from San Diego to San Luis Obispo County. Recreational boys and girls players from ages 10 to 14 came together to begin activity on a windy Saturday. While some teams had been training together for a full year, All-Star Teams were formed and began training in November. Regardless of the Division, players gave their best throughout the tournament, as well as demonstrating sportsmanship after each game with the traditional high-five line. After the conclusion of the group phase with three games played, the top teams from each group moved on to the semifinal, and eventually two would dispute the championship title. The Templeton Youth Soccer All-Stars stood out throughout the tournament, sweeping the Girls Division, and clinching the Boys 12U Division. Temecula Valley Soccer Association earned the Boys 10U Championship, while the OJSC All-Stars took home the Boys 14U trophy. The smile on each player’s faces said it all, proving that the Cal South Recreational Tournament of All-Stars was a success and that this tournament proved to fulfill the main objective of recreational soccer, to practice a fun sport like soccer in a fun and safe environment.